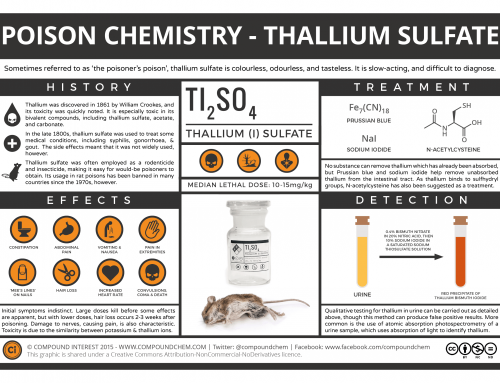 This graphic is the first in a planned series looking at the effects and chemistry of a range of different poisons. As such, it seemed appropriate to start with one of the most well known poisons: arsenic. 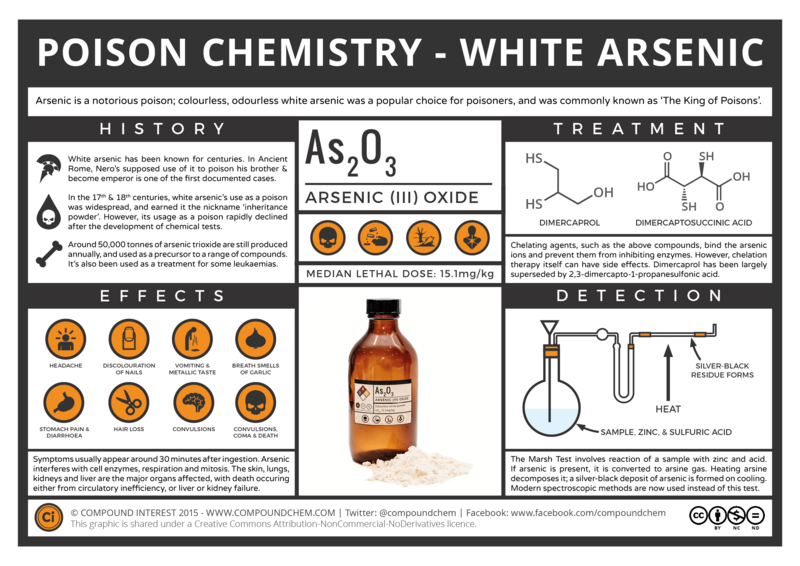 Arsenic has been used by poisoners for centuries, primarily in the form of white arsenic, or arsenic trioxide, which this graphic focuses on. Arsenic Trioxide has, according to some sources, been used in traditional Chinese medicine for over 5000 years. Whilst there is no definitive record of its first use as a poison, it’s doubtless been utilised as one for a number of centuries, over which it has been used to depose of relatives, officials, and rulers. Its popularity owes much to its appearance and smell: colourless and odourless, its addition to food is as a consequence difficult to detect. Arsenic was particularly popular as a poison in the 17th and 18th centuries, and it gained the nickname ‘inheritance powder’ for the ubiquity of its use in disposing of spouses or relatives. What also helped was the fact that very little was required – in fact, little more than the size of a pea could constitute a lethal dose. It was, at the time, very easy to obtain in the amounts required to kill; Fowler’s solution, a popular medicinal tonic at the time, contained arsenic trioxide dissolved in potassium carbonate solution, and the compound could also be easily obtained as a rat poison. Additionally, prosecutors could often summon little in the way of evidence against poisoners, due to the lack of any chemical tests that could identify arsenic’s use. The initial symptoms of arsenic poisoning were often hard to distinguish from those of food poisoning at the time, another factor which made it difficult to prove cases of poisoning. Symptoms commonly appeared around thirty minutes after ingestion of arsenic, though this could be delayed if it was eaten with food. These symptoms included fatigue, headache, numbness, and palpitations. A metallic taste may also be noted in the mouth, and a victim’s breath may also develop an odour resembling that of garlic. 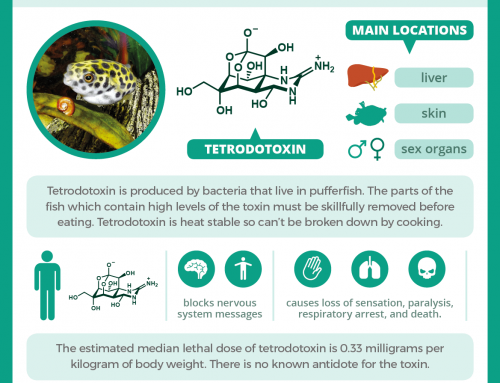 In cases of acute poisoning, the symptoms quickly become more severe. Stomach pains progress to diarrhoea and vomiting, and the victim may also pass bloody urine. Psychosis and hallucinations can follow, and subsequently seizures, coma, and death. Around 95% of any arsenic trioxide ingested is absorbed in the gastrointestinal tract, and from this point it can inflict damage across the body, with the main organs affected being the skin, lungs, liver, and kidneys. Death often occurs within 24 hours of ingestion of the poison, as a consequence of a failure of circulation or shock. If the victim perseveres through, they will likely eventually succumb over the subsequent days to either liver failure or kidney failure. Should the victim happen to be poisoned more slowly and methodically, they may also experience loss of hair, and discolouration of the fingernails may also indicate the poisoning. Of course, as the number of murders utilising arsenic poisonings increased, so chemists turned their attentions to trying to develop tests to detect the element in tissue samples from its victims. As these tests were developed, arsenic poisoning became less popular as the likelihood of the poisoner being sent to the gallows increased. The first major test which could be utilised was developed by Carl Wilhelm Scheele, who reacted arsenic trioxide with nitric acid and zinc to produce arsine (AsH3), a gas with a garlic odour. Whilst Scheele’s test was of some utility, it didn’t produce physical evidence that could be presented in court. 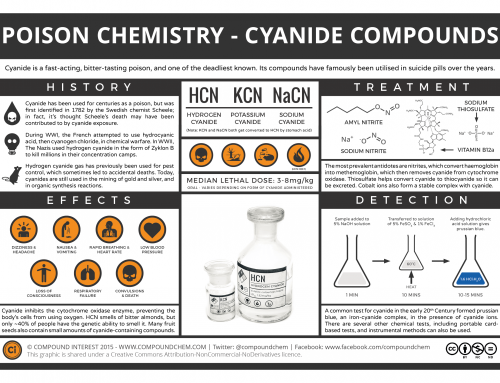 A test which did produce physical evidence was developed by Samuel Hahnemann, who combined a solution made from the sample with hydrogen sulfide and hydrochloric acid to produce arsenic trisulfide, a yellow-coloured compound. Unfortunately, this compound degraded with time, so its use as evidence was somewhat limited. Another test was needed. This is where the chemist James Marsh stepped in. In 1832, he altered Scheele’s method, reacting an arsenic-containing sample with zinc metal and sulfuric acid. As with Scheele’s method, this produced arsine gas, but Marsh then heated this gas. Heating arsine causes it to decompose into arsenic and hydrogen gas; when the arsenic contacts with a cold surface after heating, it leaves a characteristic silver-black residue, which could be preserved and used as evidence against poisoners. The Marsh test was very sensitive, capable of detecting as little as 0.2 milligrams of arsenic in a sample. It was also very specific for arsenic; the only other element which gave a similar-looking residue was antimony, but this could be resolved by attempting to dissolve the residue in sodium hypochlorite solution. The antimony residue, unlike that of arsenic, would not dissolve in this solution. After the development of the Marsh test, poisonings using arsenic sharply declined. At the time, treatments were limited, so being poisoned by arsenic compounds usually meant certain death, with little that doctors could do to prevent it. In the modern day, there are some measures that can be taken, though their efficacy is reduced the longer the duration between the initial poisoning and the treatment. Pumping the stomach can prevent some of the poison being absorbed into the body if it is carried out soon after the poisoning. Intravenous therapy is also utilised. Additionally, chemical compounds generally referred to as ‘chelating agents’ can be administered; these compounds bind to the arsenic and help to prevent its toxic effects in the body. Examples of compounds that can be used to do this include dimercaprol, also known as anti-lewisite, which was developed as an antidote to the chemical agent lewisite in World War II. Other, more soluble compounds with lower toxicities are now more commonly used. Today, poisons using arsenic are rare; the last person to be convicted of using arsenic as a poison was Marcus Marymont, a US sergaent, who in 1958 used white arsenic to poison his wife. Arsenic trioxide is used today as a treatment for some types of leukaemia, and is given intravenously as a low concentration solution due to its toxicity. It has been shown to induce death of cancer cells, though the mechanism by which it does so is still unclear.